30 Jul 2018 --- The portfolio diet, a plant-based way of eating previously shown to lower cholesterol levels, also reduces other risk factors for cardiovascular disease including blood pressure, triglycerides and inflammation, University of Toronto researchers have found. In addition to reducing LDL (or “bad”) cholesterol by about 30 percent when combined with a low-saturated fat diet – a level comparable to medications – the researchers found the diet limited other factors for an estimated 13 percent reduction in the overall risk for coronary heart disease, which includes angina and heart attack. The portfolio diet has four main components. Based on a 2,000 calorie diet, it includes 45 grams of nuts, or about a handful; 50 grams of plant protein such as soy, or pulses like beans and peas; 20 grams of viscous soluble fiber from oats, eggplant, apples, etc. ; and 2 grams of plant sterols – natural compounds that inhibit absorption of cholesterol and are often included in enriched products like margarine. The researchers conducted a meta-analysis that combined results from seven controlled trials involving more than 400 patients, and found that specific risk factors varied from about a 2 percent reduction (for blood pressure) to a 32 percent reduction (for inflammation). Dietary and lifestyle modifications can enable patients to manage high cholesterol and cardiovascular risk, and the current study provides further rationale for that approach. “One nice thing about the diet is that the effects are additive, so adopting one or more components is better than none. 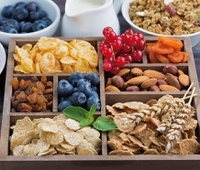 It's not an all or nothing proposition, which is why we also call it a dietary portfolio,” says Sievenpiper. The study's findings on inflammation are particularly exciting, Jenkins says. Growing evidence suggests inflammation plays a role in cardiovascular disease, but recent studies have linked it to a host of other diseases, including cancer. “Especially with chronic lymphocytic leukemia, prostate cancer, and other watch-and-wait diseases, reducing inflammation may greatly extend a patient's lifetime,” says Jenkins. Some patients also choose the portfolio diet for ethical and environmental reasons – plant-based diets generally have a smaller eco-footprint than standard Western diets – or in the case of children, to head-off future health problems.